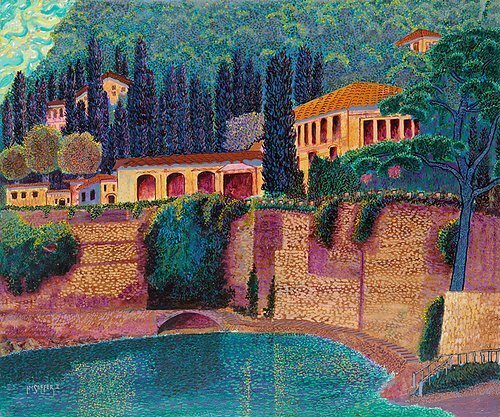 H.M. Saffer II’s style of painting has shifted from exclusively works on paper to include oils. He began melding his Oriental influences with his Western styles in order to create new and different path towards interpersonal visual expression, and his current works are a reflection of this mélange. Born July 18, 1942 in Philadelphia, Pennsylvania, H.M. Saffer II launched his career by exhibiting his art at a public art show at the tender age of six. Upon graduation from Temple University in 1965, he traveled to Paris, France to enroll in graduate economics courses. Concurrently, HM's path took a different twist, as he soon leveraged his musical talent performing with notable French stars Hugues Aufray, Jacques Brel, Charles Aznavour, and many others. He was later hired by Barclay Records as a producer, and had several hit records in 1968 and 1969. During this period, he was also the chef / owner of two restaurants in Paris, and later a third located in Ibiza, Spain. Remarkably, as engaged as he was, HM never stopped painting and exhibiting his works. Several of his shows - sponsored by his restaurants and music associates - ""sold out"" and were favorably written up by the press. Before returning to the United States in 1970, he completed selected studies at L'Ecole Des Beaux Arts and exhibited in Paris and Brussels, Belgium. HM has instructed at the Norman Rockwell Museum in Stockbridge, MA, Berkshire Community College, and Columbia-Greene Community College. He currently has gallery representation both in the United States and internationally.